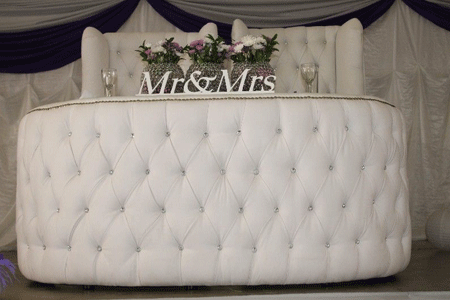 Padded Table/Counter used at weddings for the Bride and Groom. They ideal for special functions. For more information request a free quote. And African countries like Algeria, Angola, Benin, Botswana, Burkina, Burundi, Cameroon, Cape, Central, Chad, Comoros, Democratic, Republic, Djibouti, Egypt, Equatorial, Eritrea, Ethiopia, Gabon, Gambia, Ghana, Guinea, Ivory, Kenya, Lesotho, Liberia, Libya, Madagascar, Malawi, Mali, Mauritania, Mauritius, Morocco, Mozambique, Namibia, Niger, Nigeria, Rwanda, Senegal, Seychelles, Sierra, Sudan, Swaziland, Tanzania, Togo, Tunisia, Zambia, Zimbabwe.